Eddie Alvarez acknowledges fans during a UFC 205 workout at Madison Square Garden. 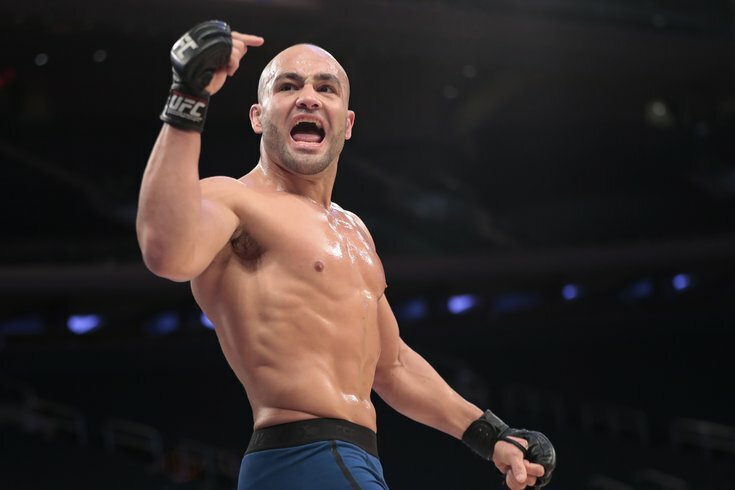 It’s been a while, but on May 13th former UFC lightweight champion and Kensington native Eddie Alvarez will return to the octagon for the first time since surrendering his title to Conor McGregor at UFC 205. He’ll face fellow lightweight Dustin "The Diamond" Poirier at UFC 211 in Dallas, the UFC confirmed on Tuesday. Alvarez (28-5), who became the first MMA fighter to win titles in both of the sports' major promotions (UFC and Bellator) by knocking out Rafael dos Anjos last summer, suffered a second-round knockout against McGregor at Madison Square Garden back in November. And despite the long layoff, he still remains the third-ranked lightweight contender. The 28-year-old Poirier (21-5), who most recently beat Jim Miller on Feb. 11, has also been knocked out by the current champ, McGregor. That came back in September of 2014, and he has since won five of his last six fights (three by knockout). Currently, he's the 10th-ranked lightweight contender.